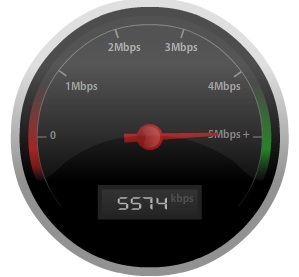 There are just times when it seems like our internet speed just drags... wanta check your speed? You can test your system regularly and determine slow times or if there is a consistent problem. Close down any running programs on your computer that might take bandwidth. Make sure you computer isn't downloading any updates. Be sure that no other computers are using bandwidth on your wired or wireless router. Dial-up ranges between 30 and 53.3 kilobits per second while DSL ranges between 300 and 768 kbps. Cable Internet has 1,000 kbps speeds. If your connection is lower than you expected, then contact your Internet Service Provider. Tidbit of information: A bit is the smallest unit of digital information. 8 bits make up 1 byte.